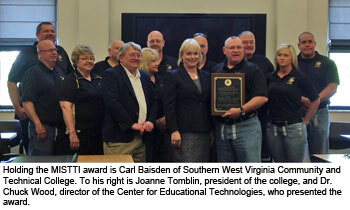 WILLIAMSON, WV — Thanks to its innovative approaches for training coal miners and its many contributions to coal mining safety research, the Academy for Mine Training and Energy Technologies at Southern West Virginia Community and Technology College today received national recognition at a ceremony held at the college. The Wheeling Jesuit University Mining and Industrial Safety Technology and Training Innovation (MISTTI) project, funded by the U.S. Centers for Disease Control's National Institute for Occupational Safety and Health (NIOSH), recognized the academy for its contributions to coal mining safety research and training projects that support worker safety and health. The MISTTI award noted that the academy's work represents a significant technology innovation for state-of-the-art simulation training for workers. The Academy for Mine Training and Energy Technologies offers what Dr. Charles Wood, principal investigator for the MISTTI project and executive director of the Center for Educational Technologies at Wheeling Jesuit, calls a one-of-a-kind underground mine simulation and state-of-the-art 3D simulator. "The academy at Southern sets the standard for training those interested in a career in mining or energy technology," Wood said. "The simulators at Southern immerse students in real life situations without hazard exposure. They provide current miners with cross-training on new equipment and enhance management training through various operating conditions." The underground mine simulation provides hands-on training and prepares and enhances student knowledge of what to expect underground. A first in the industry, the underground simulation feels and looks like a real mine. It contains various work labs to increase miners' ability to be safer, more efficient workers. Carl Baisden, director of mine training and energy technologies at Southern, received the award on behalf of the academy. Joanne Tomblin, president of Southern West Virginia Community and Technical College, also participated in the award ceremony along with Dr. Harry Langley, vice president for academic affairs and student services; Samuel Litteral, vice president for finance and administration; Ron Lemon, vice president for development; and Allyn Sue Barker, vice president for economic, workforce, and community development. Joining Wood in presenting the MISTTI award was Dr. Laurie Ruberg, evaluator of the MISTTI project and associate director of the Center for Educational Technologies.